The Russian Tsvetnaya Bolonka was originally discovered after the fall of the Iron Curtain in Russia, but can be traced back to as early as the 18th century. 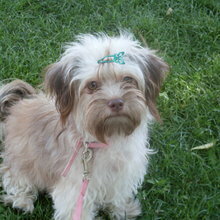 A small Maltese-like breed was presented as gifts to Russia by the French court of Louis IV. Eventually, a breed similar to the Bichon Frise emerged. 7-10 inches (17-25 cm.) The body is slightly longer than the height at the withers, just off-square. The Russian Tsvetnaya Bolonka has a long, luminous coat with characteristic large curls. The coat should not resemble that of a Yorkshire Terrier in length or softness. The Russian Tsvetnaya Bolonka is a playful and jolly breed. Their loving and devoted demeanor makes them the perfect little lap dog that will sit with you for hours. The Russian Tsvetnaya Bolonka is a playful and jolly breed. Their loving and devoted demeanor makes them the perfect little lap dog that will sit with you for hours. An intelligent and energetic breed, the Russian Tsvetnaya Bolonka will require a firm, yet gentle approach to training. They are very social dogs and get along well with other animals. You can find Russian Bolonka puppies priced from $1200 USD to $3500 USD with one of our credible breeders. Browse through our breeder's listings and find your perfect puppy at the perfect price. An intelligent and energetic breed, the Russian Tsvetnaya Bolonka will require a firm, yet gentle approach to training. They are very social dogs and get along well with other animals. The Russian Tsvetnaya Bolonka is an ideal pet for apartment living, as they can be active inside and will do well without a yard. These dogs are happy to adjust to life in the country as well. The life expectancy of this breed ranges from 12 to 16 years. They will require brushings regularly. Bathe when necessary and towel dry til damp, then use a wide tooth comb on the coat. Blow-dry sparingly to keep the breed's signature curl. As stated previously, the Russian Tsvetnaya Bolonka will require a firm but kind hand when training. To avoid “Small Dog Syndrome”, be sure to be the confident and consistent pack leader. As with any small breed, you must remember that they are not humans and their animal instincts must be met. The Russian Tsvetnaya Bolonka is a spunky little breed and will require a certain amount of exercise. In small living quarters, this breed will require a daily walk in addition to their indoor play. When provided a large yard, the Russian Tsvetnaya Bolonka requires little additional exercise. Russian Bolonka Puppies for Sale - Shipped Worldwide! Finding the right Russian Bolonka puppy can be dog gone hard work. PuppyFind® provides a convenient and efficient means of selecting and purchasing the perfect Russian Bolonka puppy (or Russian Bolonka puppies) from the comfort of your home, 24 hours a day, 7 days a week. Take advantage of our PuppySearch or leisurely browse our directory of hundreds of dog breeds, Russian Bolonka dog breeders, Russian Bolonka dogs for adoption, and Russian Bolonka puppy for sale listings with photos and detailed descriptions. Some Russian Bolonka puppies for sale may be shipped Worldwide and include crate and veterinarian checkup. Many Russian Bolonka dog breeders with puppies for sale also offer a health guarantee. With thousands of Russian Bolonka puppies for sale and hundreds of Russian Bolonka dog breeders, you're sure to find the perfect Russian Bolonka puppy.